We have just finalised the design for the remodeling and extension of a family house in Bærum, near Oslo. The detailed drawings package has now been sent to potential builders and, before construction starts this spring, we would like to share some of the ideas behind our design approach. Our clients, a young Norwegian couple with a toddler, had purchased a derelict detached house in the neighbourhood of Gjettum. The existing house had been divided into two rental apartments, one on each floor, connected by a shared entrance staircase. The general feeling of the existing house was somewhat claustrophobic: the redundant spaces created by the two identical floor plans, the small cellular rooms and window-less corridors, the few oversized windows... All contributed to the impression of undersized spaces. A large garden surrounds the house but this was completely disconnected from the interior. It was also mostly spoiled by a garage and a long driveway to the south boundary of the site, which made the approach to the building unwelcoming. An obvious solution would have been to extend the house to open up the main living spaces. 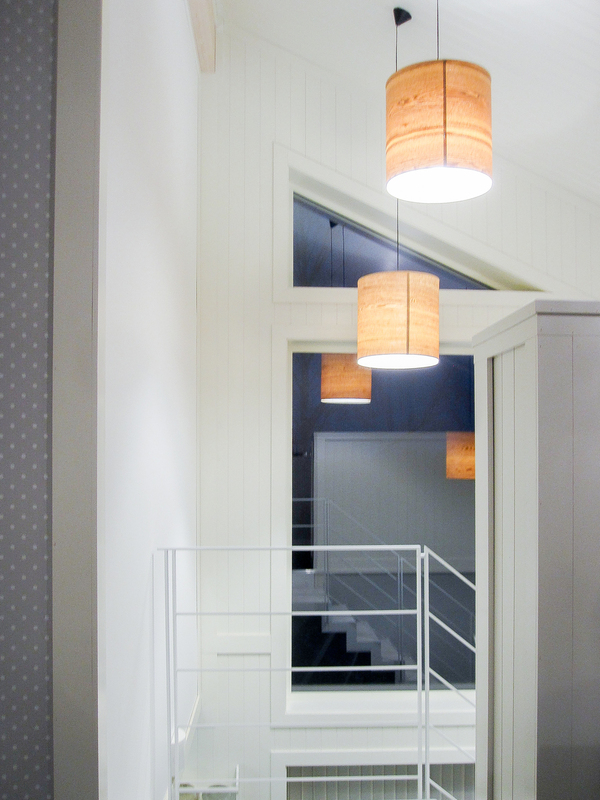 However, as in many of our projects, we focussed on making the most of the existing building. Key to this approach was to reconnect the various living spaces — both interior and exterior — so that the different architectural functions could flow into one another. Our first step was to move bedrooms to the upper floor, so that we could gather all social spaces on the ground floor, just a step away from the garden. We then removed a few internal walls to open two long perspectives across the whole ground floor. This created a close connection to the garden, making it both visible and easily accessible from all living spaces. These spaces — where eating, relaxing and socialising take place — naturally organised themselves around these open lines, articulated by the existing staircase and a new wood stove. Each living space is designed with its own sense of scale and openness. Yet, it can be used as an extension of another, giving maximum flexibility both for everyday life and for the large social gatherings that our clients love to host. 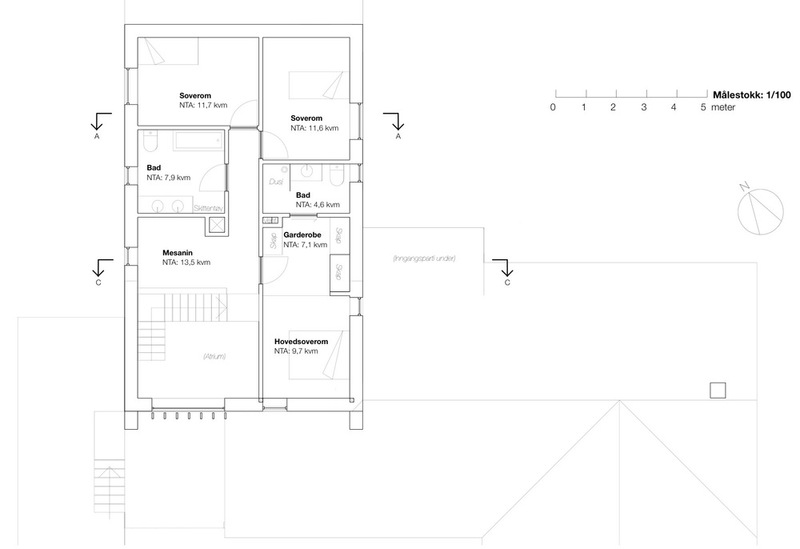 The kitchen — the natural heart of the house for the family — is now placed at the very centre of this plan and is connected to all surrounding social spaces. A screen of open shelving wraps around the kitchen, to subtly shelter it and discretely accommodate storage, appliances and a study (that doubles as an accessible guest bedroom) on the north-east. Each of the living-rooms extends to the garden through large French doors: on the south-east, onto a large timber terrace stepping down to the main garden, and on the south-west to a more private terrace that opens the dining room to the evening sun. Since all windows had to be replaced, we took this opportunity to redesign many of the openings to the garden, drawing daylight from different directions in all spaces and carefully framing attractive views to the outdoors. To the south, we created a new functional and welcoming entrance to the house that also accommodates an accessible modern bathroom. Both this small extension and the new garage (relocated closer to the access road) are designed with similar flat roof details and horizontal cladding, contrasting with the taller existing house. Together, they frame an attractive new approach to the house that echoes the traditional "tun" of Norwegian farmyards, under the dappled shade of newly planted cherry trees. A new family bathroom and four bedrooms are located on the upper floor. One of these rooms doubles up as a separate TV/play room, where extra guests can stay overnight. The basement is also remodelled: two thirds of it are transformed into a comfortable self contained apartment, which will be rented out to tenants before becoming an integral part of the house for family guests and teenager children. The large new windows bring plenty of daylight into the space and the separate access to the north and landscaping create a small private garden for the tenants. The remaining space in the basement accommodates a large washroom, as well as the technical installations and storage. As part of the remodeling, we upgraded the whole house to meet current energy conservation standards, externally insulating the fabric of the building and replacing the existing windows with highly insulated ones. We also made the most of the panoramic wood stove on the ground floor by coupling it with a modern balanced ventilation system: diffusing the stove heat in the whole house — including the four bedrooms upstairs— we could design the house so that most of the heating needs would be provided by renewable firewood, while also keeping optimal indoor air quality. 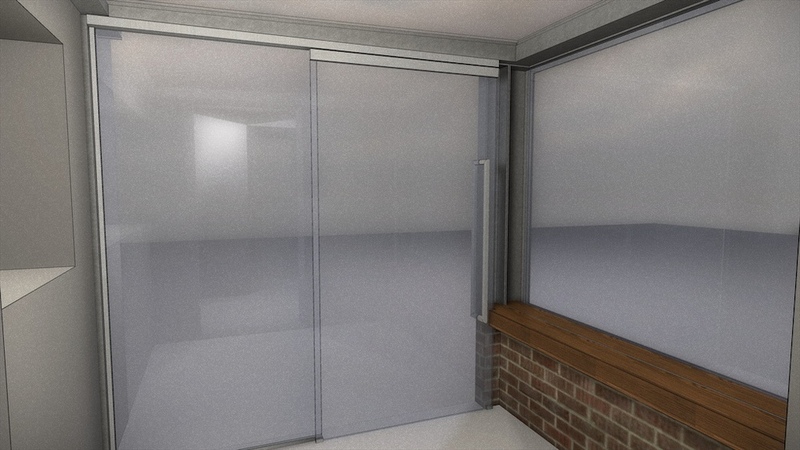 The Geze sliding door works like a charm and has appropriately minimal lines. Our clients have sent us these pictures following the successful completion of their "porch that turns a house around". The porch features a brick plinth that creates a seat within the space, and a superstructure made of standard sized galvanised steel channels. At the top of the structure, the channels form structural gutters which carry the rain away without the need for an overhang. The overall effect is of a large three-sided window frame: one window faces the sky to allow natural light into the existing kitchen window, one holds the welcoming entrance door and the third frames views down the garden from the kitchen sink. Simple looking projects are not always easy to complete, and the glazing contractor found it impossible to get the right door components from Geze UK for this one. However a couple of nicely worded emails to the uber efficient head office in Germany unlocked the supply chain and the key component eventually made it to site. 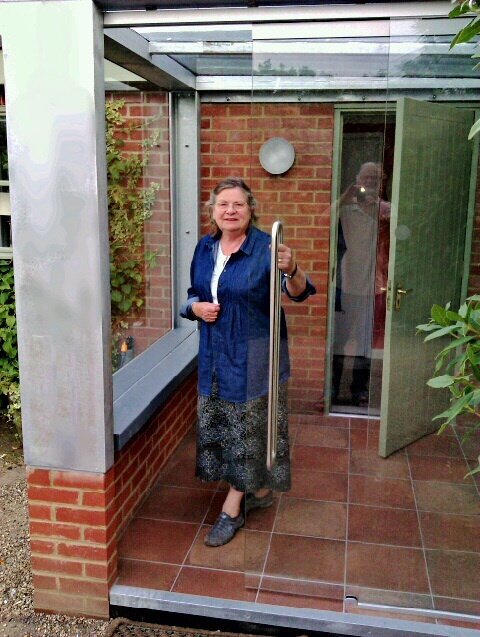 In place, the sliding door works like a charm and has appropriately minimal lines... Everyone happy in the end! The upper channels are structural gutters, channeling water away without requiring an overhang. The porch has a brick plinth/seat with the main structure in galvanised steel. 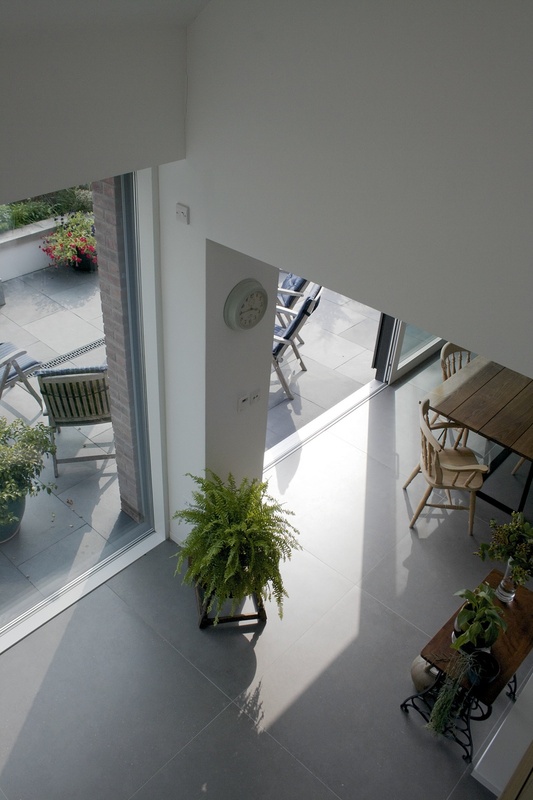 A high proportion of glass allows plenty of daylight in through the kitchen window and maintains views down the garden. 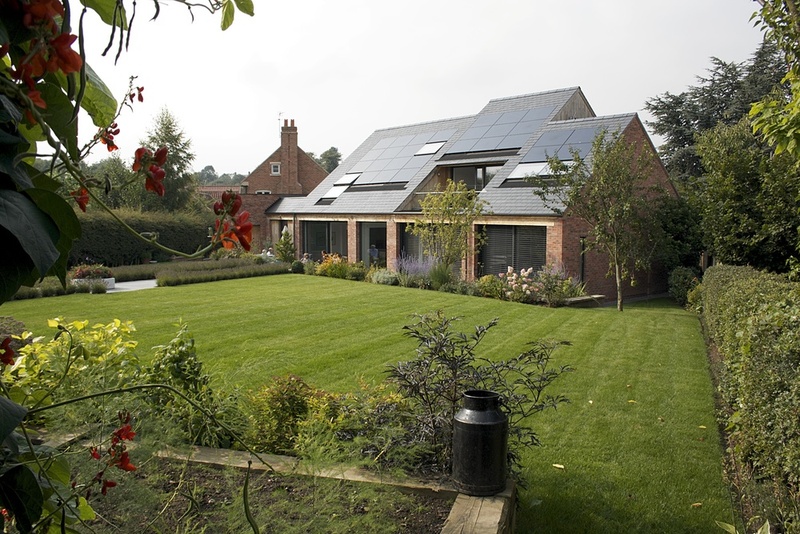 We're very proud to say that the low energy house 2hD designed for a Nottinghamshire village has been shortlisted for an RIBA East Midlands 2014 award! The annual awards celebrate architectural excellence in the region, and the New House in Maplebeck is one of just eleven projects on the shortlist. Replacing a 1980s bungalow, the design of the house had to complement the Conservation Area setting whilst achieving extremely high performance as a “zero carbon in use” eco-home. Designed using the PassivHaus Planning Package and executed in a palette of brick, oak, slate and zinc, the house includes a central frameless glazing porch and open stair, an integrated balcony and an extensive built-in photovoltaic array. We've been working on the remodelling and extension of a Suffolk cottage for some time now — starting with our 2009 RIBA award winning artist's studio. An internal reworking of the ground floor has improved circulation, usable space and natural lighting. The final element is now on site: a glass and steel porch at the back door will create a generous welcome space and energy-saving draft lobby. We often find with existing houses that the 'back door' is in fact the main access for family, guests and deliveries alike, and a decision has to be made: reinstate the status of the front door, or accept the established usage and make the back door a decent point of arrival? In this case the 1980s flat roofed 'garden room' extension to the rear of the house - with improved windows and insulation - has become the main area for entertaining guests; the new porch will turn the house around and connect it all back together. Our clients are now finalising the site work on our remodel of their home in Eidsvoll, Norway. We were originally approached by the clients in 2011, to reorganise a family house that has become overcrowded for their family of five and — more importantly — to create a modern comfortable home they would be proud of. Already extended once, this house was in fact spacious enough for the family. Yet the existing layout made poor use of the internal space: stiffly compartmenting into disconnected rooms, the floor plans created several "dead areas" on key locations of the three levels, which were mostly left unused by its inoccupants or barely used for storage. The existing services were obsolete and poorly placed — with no bathroom on the ground floor for instance — and the clients were eager to upgrade the building fabric and technical installations as part of the remodelling exercise. Summer overheating and noise from the increasing overhead airport traffic were particularly problematic. Conscious that their three teenage sons would be soon leaving the family home, the parents were also willing to remodel the house so that the upper floor could easily be isolated from their accessible quarters on the ground floor in the coming years, to be rented out to tenants with minimum additional work. All these had to be address with minimum alterations to the exterior of the building, to fit the budget and the local planning rules. 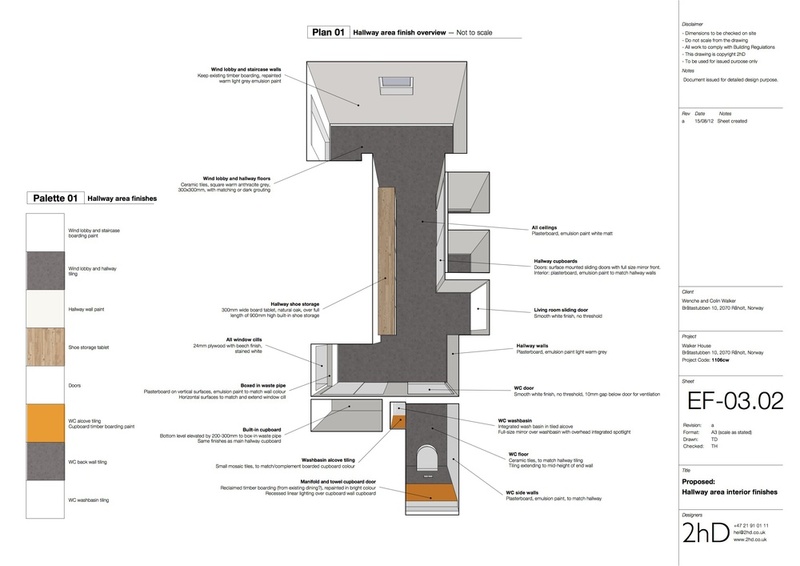 After a detailed survey of the existing house, we identified key factors breaking the flow through the house. These were tackled by a series of strategic moves that could unlock the potential of the space in a cost effective way. At the core of the approach was to clarify the organisation of public and private spaces, and how these flowed into one another. 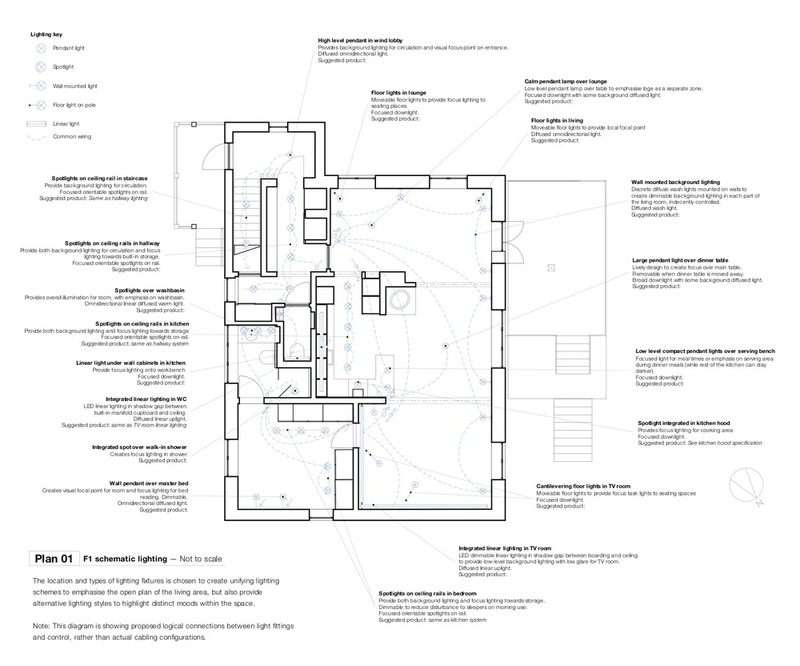 A few key changes to the internal building fabric allowed us to both connect the spaces for greater flexibility in use (to host large family events, for instance) and respond to the need for privacy between the different parts of the house. 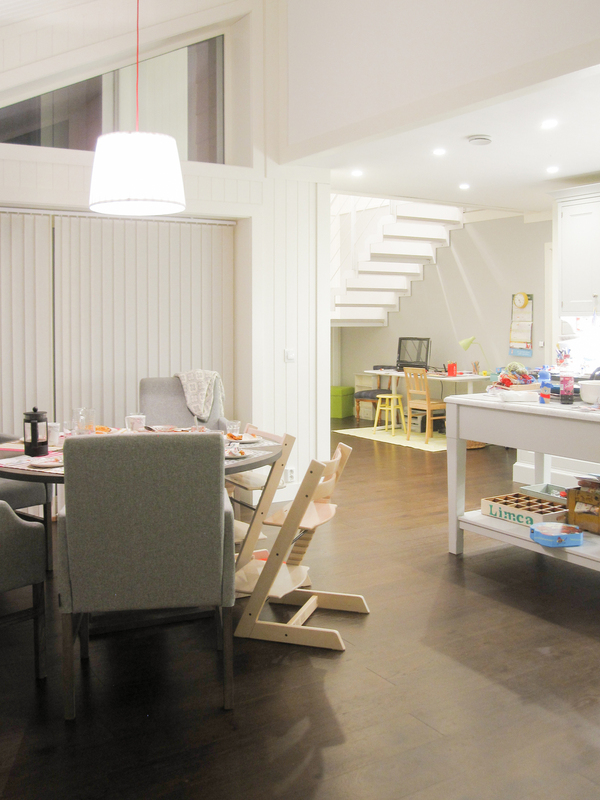 Altering the floor plans was the first move to transform this home. We extended this approach to carefully select interior materials and light fittings, to suggest and emphasize the new relationships between the spaces. Entering the house, the visitor is drawn further into the spaces by a series of focal points revealing themselves progressively from different viewpoints as the house is explored, linking the social spaces and the large garden outdoors. The timber structure was fully re-insulated internally, using high density natural wood fibre insulation to improve all year round thermal comfort and dampen external noise. Comfort was further improved by replacing the existing windows with hi-spec new low-energy and noise reduction glazing. With minimal changes to the existing drainage system, two new family bathrooms and a guest toilet were added to the ground and first floors. Connected to a new centralised ventilation system, they dramatically improve indoor air quality in a quiet and energy efficient way. Working in close collaboration with the clients, with their in-depth knowledge of every corner of the house and the way it was constructed, allowed very detailed design and planning of all the alterations, while keeping building costs low. We've given you a clear idea about your destination, and working with the builder, engineer and others we've mapped out a route to get you there. But when embarking on a remodelling project there's often no way round the forest of 'acrow props' that will temporarily invade your space. This cottage remodel will open up three poky little rooms into a decent living space and connected kitchen. Opening up space like this can transform a house but the joys of open plan living can quickly die if it's not right for your lifestyle- we always try to balance the breathing space and light created by larger spaces with the functionality and feeling of security offered by cellular rooms. This approach brings out the best in existing buildings and delivers spaces that meet our client's needs. Invented in 1935 by a Swiss engineer, the Acrow Prop provides adjustable temporary support for the existing structure while new elements such as beams and coloumns are inserted. Their appearance signals a major advance in the project, but the Forest of Acrow can seem a gloomy and threatening place too. Things get more complex by the day, the route can be hard to see and final destination feels further away than ever. Time to look at those visualisations again and keep moving forward- end results like this will be worth it!